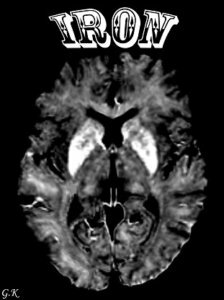 Recent advances in Magnetic Resonance Imaging (MRI) have made it possible to noninvasively quantify iron that accumulates in people’s brains. In the brain, iron is found in two forms: heme iron, found in the blood, and intra-cellular nonheme iron. Nonheme iron is a fundamental element that contributes to cellular metabolism. However, an overload of free nonheme iron in the brain is highly toxic, inducing oxidative stress, inflammation, cellular degradation, and cell death. Excessive concentrations of brain iron have been found in virtually all neurodegenerative disorders (e.g., Parkinson’s disease, Alzheimer’s disease) and also in non-pathological aging. Except a handful of studies that showed a deleterious effect of increased brain iron load on structural brain integrity and cognition in normal aging, very little is known on brain iron metabolism in aging. In a pilot study that included 40 healthy younger and older adults, we showed that more iron in striatum was related to lower frontostriatal activity, lower functional connectivity of striatal networks, and poorer memory and motor performance in old age*. 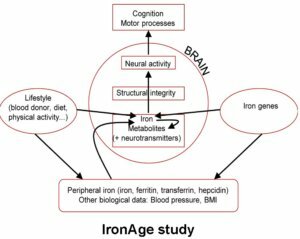 The longitudinal IronAge study has 2 major aims: (1) To investigate the effects of age-related brain iron accumulation on structural, molecular and functional neural changes and cognitive decline; (2) To determine the genetic, biological and lifestyle factors associated with brain iron accumulation. The baseline data were collected in 208 healthy individuals aged 20-79 years in 2016-2017. Follow-up data collection is planned for September 2019-May 2020. Lab data: serum ferritin, transferrin, hemoglobin, hepcidin, cholesterol, triglycerides, CRP, etc. Metabolomics on serum (NMR): amino acids, glutathione, lipids, glucose, etc. Physiological data: blood pressure, pulse, BMI. From questionnaires (self-reported): demography, medication, teeth health, alcohol intake, smoking, macro- and micro-nutrients’ intake from food-frequency questionnaire (e.g. iron, cholesterol, fatty acids, vitamins, fiber, carbohydrate), physical activity, social activity, mental activity, sleep, personality, memory self-efficacy beliefs, perceived stress, depression, blood donor status, menopause. Behavior: Tests of motor speed, perceptual speed, working memory, executive functions, episodic memory. MRI sequences on 3T GE scanner: T1, T2-FLAIR, MR spectroscopy single voxel in (1) right putamen and (2) right dorsolateral prefrontal cortex (metabolites e.g. glutamate, NAA, myo-inositol, …), DTI 64 directions, 2 sequences for iron multi-echo Gradient Recalled Echo 8 TEs each, resting-state functional MRI with respiration and pulse data, functional MRI during working memory task N-Back, functional MRI during motor imagery task. *Kalpouzos G, Garzón B, Sitnikov R, Heiland C, Salami A, Persson J, Bäckman L (2017). Higher striatal iron concentration is linked to frontostriatal underactivation and poorer memory in normal aging. Cerebral Cortex 27: 3427-3436. *Salami A, Avelar-Pereira B, Garzón B, Sitnikov R, Kalpouzos G (2018). Functional coherence of striatal resting-state networks is modulated by striatal iron content. NeuroImage 183:495-503. Garzón B, Sitnikov R, Bäckman L, Kalpouzos G (2018). Automated segmentation of midbrain structures with high iron content. NeuroImage 170:199-209. Garzón B, Sitnikov R, Bäckman L, Kalpouzos G (2017). Can transverse relaxation rates in deep gray matter be approximated from functional and T2-weighted FLAIR scans for relative brain iron quantification? Magnetic Resonance Imaging 40: 75-82. The pilot Iron study was financially supported by grants from Loo and Hans Ostermans Foundation for Medical Research, Karolinska Institutet’s Research Foundation, the Foundation for Geriatric Diseases at Karolinska Institutet, Gun and Bertil Stohne’s Foundation, and Stiftelsen för Gamla Tjänarinnor. The IronAge study is financially supported by 2 grants from the Swedish Research Council, and a grant from Karolinska Institutet.